Anhui Cuisine consists of South Anhui, Yanjiang and Yanhuai cuisine styles. South Anhui Cuisine, the origin and main component of Anhui Cuisine, uses ham and crystal sugar as seasonings and has a salty and delicious taste and pleasant aromas. Yanjiang Cuisine is known for dishes prepared with aquatic products and fowls, featuring clear, refreshing, crisp, tender, delicious and mellow tastes. Yanhuai Cuisine is salty, plus slightly spicy, with coriander and peppers as seasonings. Anhui Cuisine has the following four characteristics: 1. Using a wide variety of ingredients. 2. Adopting unique techniques. 3. Paying great attention to nutritious food. 4. Offering various kinds of dishes, some of which are full of local flavor. Famous dishes: Milky Fat Fish King, Stewed Mati Soft-shelled Turtle in Clear Soup, Guest Welcoming Pine, Crucian Carp in Earthen Pot, Fuliji Chicken, Red Bayberry and Glutinous Rice Balls, etc. Local snacks include Butterfly Noodles, White Gourd Dumplings, Frozen Rice Sugar, Tunxi Liquor-saturated Crabs, etc. Also known as Stewed Ham and Softshelled Turtle, it is the oldest traditional famous dish of Anhui Province, prepared with softshelled turtles from the mountain areas in south Anhui. Famous poets and scholars in ancient times took special trips to Huizhou to taste this delicious dish. Now this traditional course is well known throughout the country. Bamboo shoots are produced in Wenzheng Hill in.Shexian County, Anhui Province. As the most famous local dish in vegetarian dishes of Anhui, this dish is known for jade white, crisp, tender, delicious bamboo shoots. It is a famous traditional dish of Wuwei County, Anhui Province, with a history of over 200 years. As one of the favorites of Anhui people, this dish features a golden yellow color, and thick, tender and delicious meat. It is a well-known local dish of Anhui Province, prepared with high-quality fish from the rivers in Fengtai County, Anhui Province. Milky Fat Fish King, also known as Huaiwang Fish, provides meat as soft as bean curd, and tasty soup as delicious as chicken soup, with an orchid smell. It is a famous dish in Anhui Province. Legend has it that it was created by chefs from Fengyang. Zhu Yuanzhang, the first emperor of the Ming Dynasty, loved to eat Stuffed Bean Curd very much. He sent people to invite folk chefs to the imperial palace to prepare this dish for him. Since then this dish has been well known all over the country. Stuffed Bean Curd has a golden yellow color, crisp skin, tender inside, and a sour and sweet taste. It is an artistic cold dish in the shape of the Guest-Welcoming Pine Tree in the Huangshan Mountains. While tasting delicious food, customers can also appreciate oddly shaped pine trees and rocks in the mountains. In accordance with the Compendium of Materia Medica written by Li Shizhen, a famous doctor of the Ming Dynasty, "The way to prepare bean curd was created by King Huainan Liu An." 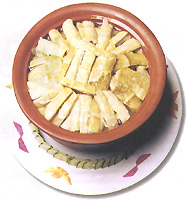 Bagong Mountain Bean Curd ranks first of over 100 kinds of bean curd products produced in China. Prepared with water from the Pearl Spring in Bagong Mountain, the bean curd is refined, white, soft, tender, smooth, refreshing and delicious, suitable for both the old and the young.